Marine electronics manufacturer Simrad has announced the launch of HALO Pulse Compression Radar – said to be the world’s first affordable solid-state, open-array radar system, featuring pulse compression technology and designed for recreational mariners. 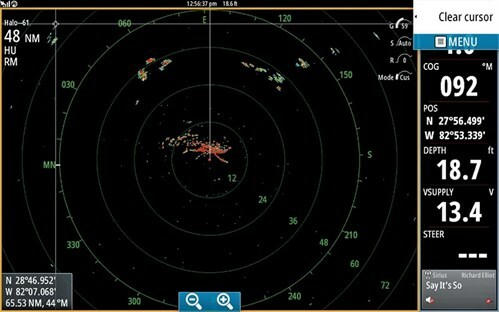 Combining the advantages of Simrad broadband radar and traditional pulse radar systems into a single solution, HALO radar provides navigational visibility and situational awareness within pulse radar’s short-range blind spot – where once only broadband radar could operate – all while offering what is said to be exceptional long-range performance up to 72nm. Unlike traditional pulse radar systems, HALO radar does not rely on a high-powered magnetron to transmit a signal. This allows it to produce an immediate, accurate radar image instantly from standby and in 16-25 seconds after power-on – eliminating the 2-3 minute warm up associated with pulse radar. Equipped with a solid-state transceiver, Simrad HALO radar features no magnetron to be replaced, and requires no periodic tuning to maintain its accuracy or performance. In addition, solid-state technology means compliance with new and upcoming low emission standards for radar, making it safe to run HALO radar in anchorages and marinas. In standby mode, Simrad HALO radar’s power consumption is 7W, compared to 10W or 15W for traditional pulse radar systems. With Beam Sharpening and enhanced Target Separation Control, HALO radar provides superb target resolution, granting each HALO radar exceptional performance for its antenna size. Another function is Dual Range mode, allowing Simrad HALO radar to function as two radar systems in one — monitoring two distance ranges simultaneously, with independent display controls, without compromising on resolution. The Dual Range mode also means dual MARPA target tracking, available when combined with a compatible heading sensor. Up to 20 targets can be tracked – 10 per distance range – displaying the closest point of approach (CPA) and time to closest point of approach (TCPA) for each. "By introducing the HALO Pulse Compression Radar system, we have given boaters the best possible combination of features, providing the perfect mix of near and distant range, reliability and resolution without the associated warm-up time, power consumption, maintenance or electromagnetic emissions," said Leif Ottosson, CEO of Navico. With its low power consumption, support for both 12V and 24V systems and availability in 3ft, 4ft and 6ft open arrays, HALO radar is ideal for small to mid-sized powerboats. The new 3ft array size and HALO radar’s low-emission technology brings the option of long-range open array radar to a smaller class of powerboats, where previously size and mounting constraints would have made broadband radar the only option. 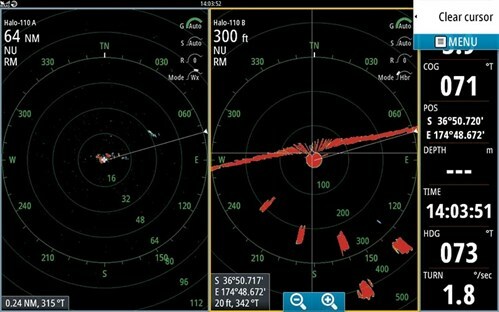 The HALO radar system connects to any Simrad NSS evo2 or NSO evo2 multifunction display system via Ethernet, with a bulkhead-mounted interface box below deck. Antenna installation has been simplified and streamlined, utilising the same thin cable and small-diameter connectors as Simrad 3G and 4G broadband radar systems. The new Simrad HALO Pulse Compression Radar will be available from authorised dealers in the second quarter of 2015. The HALO radar system with 3ft open array will have a price of $6500; the 4ft model will have a price of $7200, and the 6ft array will have a price of $7900. These prices exclude GST. 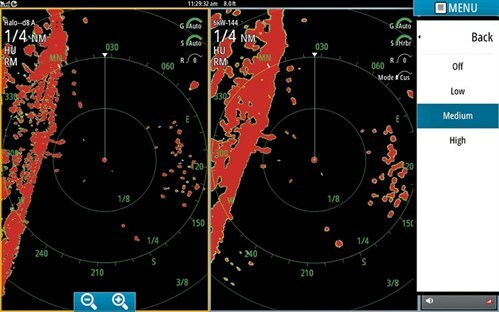 Visit simrad-yachting.com for more information about HALO radar or Simrad Yachting marine electronics.